From the very first moments of ON YOUR FEET! The Emilio and Gloria Estefan Broadway Musical, as it opens with a stripped down version of Miami Sound Machine’s “Rhythm Is Gonna Get You,” you get the feeling that the audience is about to be blasted out of their seats! And this musical IS a blast: Colorful, loud, vibrant and PASSIONATE! But it is also very touching. This post is sponsored. We received press tickets to the opening night of this show. Growing up in Florida, Miami Sound Machine was the soundtrack of my childhood. And then, just as I was getting into radio in 1990 and playing Gloria Estefan’s solo music, she was in a terrible bus accident and broke her back. This is covered in ON YOUR FEET, but there is so much more; we learn what teenage Gloria originally wanted to do for a career, and how her mother almost came to Hollywood as a girl, and that Gloria took care of her dad, who had multiple sclerosis. We also get to witness a very memorable entrance from Emilio (Mauricio Martinez), who strolls in in some of the tiniest shorts every to hit a theatre stage. How could Gloria not fall in love? And speaking of Gloria, actress Christie Prades has somehow managed to speak and sing EXACTLY like the real Gloria! She is so fantastic, dancing and singing without even sounding winded (although I do think they slowed “Conga” down a hair to make this possible for everyone!) Christie and Mauricio are the heart and soul of ON YOUR FEET, and their chemistry and playful relationship are a big reason why this show works as well as it does. Another reason is the MUSIC! “Coming Out Of The Dark,” “Get On Your Feet,” “Here We Are,” “Live For Loving You”…listening to these songs and so many more you are reminded why Gloria is the most successful Latin crossover performer in the HISTORY of pop music and has sold more than 100 million albums. And Emilio has 19 Grammy Awards, is a music, television, and film producers, and developed not only his wife’s career but also the careers of Jennifer Lopez, Marc Anthony, Shakira and more. They are a wonderful success story but also seem to still truly love each other. I have to give a special shout out to the on stage orchestra (that percussion section!!! ), along with Clay Ostwald for music direction, Alexander Dinelaris for writing the book, Sergio Trujillo for that insane choreography, and Jerry Mitchell for his direction. I would say that if your child is at least 8 years old and can sit for about 2.5 hours (there is a brief intermission between acts), it is fine to bring them. My son is 8, and I’m planning to take him to see ON YOUR FEET when it moves to the Segerstrom Center for the Arts in Costa Mesa in August. ON YOUR FEET! 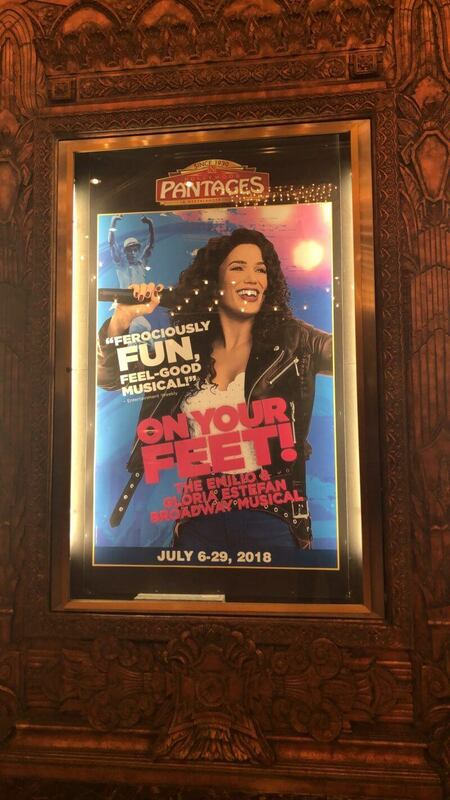 The Emilio and Gloria Estefan Broadway Musical is playing at the Hollywood Pantages through July 29th. 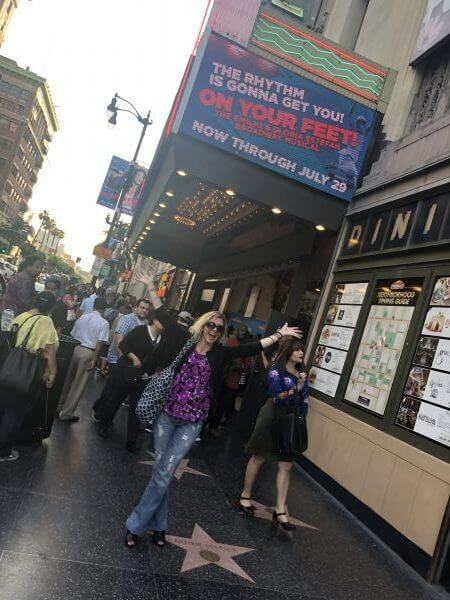 Tickets are available at www.HollywoodPantages.com/OnYourFeet and www.Ticketmaster.com, by phone at 1-800-982-2787 or in person at the Hollywood Pantages Theatre Box Office (Opens Daily at 10 am. ).